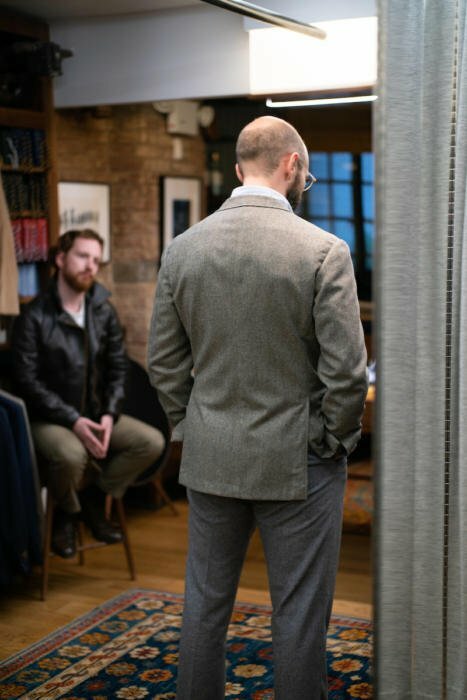 Given how much readers have liked the posts recently looking at Armoury trousers, and then the Bryceland’s range, I thought a post going through the Armoury’s tailoring would be interesting. If anything this is more needed than the trousers piece. First because there are even more options to choose from - once you take in the different models under each brand, and without even going into bespoke. And second because the range is just really good. 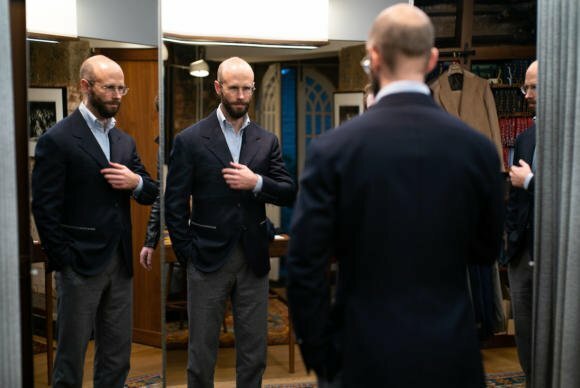 I can’t think of another shop that has this variety of ready-made and made-to-order tailoring, all made at a high quality and in styles I would wear. 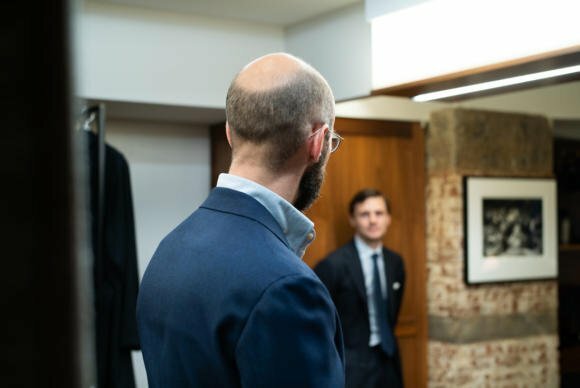 If I wasn’t so deep into bespoke I would have tried a piece by now - and I’d certainly try the made-to-measure from Ring Jacket if I happened to be there at the same time as a trunk show. There are four brands, which I’ll cover in descending order of the size of the range. These go by model numbers: 3, 6, 1, 7 and 11. The letters A or B after each one refer to the trouser style, when it’s a suit rather than a jacket. The first jacket a customer will likely be put in is the model 3 (above). This is in some ways the Armoury default style, and also the one that appeals to the greatest range of customers. It is a very softly structured jacket, with only a lightweight chest canvas that extends into the shoulder, instead of padding. But it also has a slightly extended shoulder, a little drape in the chest, and a little wadding in the sleevehead. Those last three things stop it looking too casual and Neapolitan, and suitable for a business suit as much as a casual jacket. There are some Liverano influences in there, as you’d expect, particularly the straight lapel and shoulder line. Personally, I think it’s a great, subtle style. It’s soft yet smart, and flattering in the lapel and shoulder. I wouldn’t wear it with chinos or jeans, but it’s a versatile choice for any other kind of tailoring. The jacket I’m wearing is a size 40, in a covert cloth from this past Autumn/Winter collection. It even fits pretty well, aside from some correction for my sloping shoulders and arm length. The guy that’s less likely to want the model 3 is someone that wants a sharper, more structured jacket. Or someone bigger in the body, where perhaps the softness of the 3 won’t be so flattering. This leads onto model 1 (above), which has padding rather than canvas in the shoulder and is slightly cleaner in the sleevehead too. The difference is small - indeed the model 1 has become increasingly like the 3 over time. But this is still more likely to appeal to the guy wanting a straighter business suit or blazer. These Armoury jackets are available RTW, by the way, and made to order. With the latter you can pick cloth and change things like the body length, sleeve length, and waist. But made-to-measure requires a Ring Jacket trunk show, which take place in both New York and Hong Kong stores. Model 6 (above) is the double-breasted version of model 3, so everything is the same except for the lapels, buttons etc. 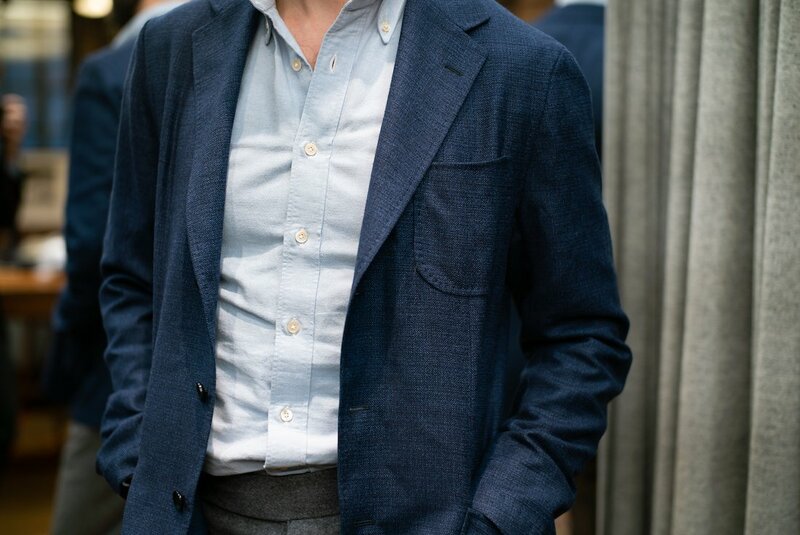 The lapels I really like. They’re wide, with a very slight belly. The peak isn’t too high or too low. The only thing I don’t particularly like is the pick stitching along the edge of the lapel, which is rather too prominent for me. It seems to cheapens it slightly. Model 7 (above) is a travel-jacket or shirt-jacket version of model 3. So again, same style details but here with no canvas in the body, and an unlined sleeve. Very lightweight and comfortable. Finally, model 11 (you guessed it, above) is the latest creation, a more casual jacket modelled with some Ivy League styling. So while the body shape is similar to the other jackets, the lapel is smaller and shorter and it rolls higher on the body. The hip pockets have buttoned flaps and a bellows style, while the breast pocket has a tiny, very subtle point at the bottom. Which might be my favourite style detail of the whole range. 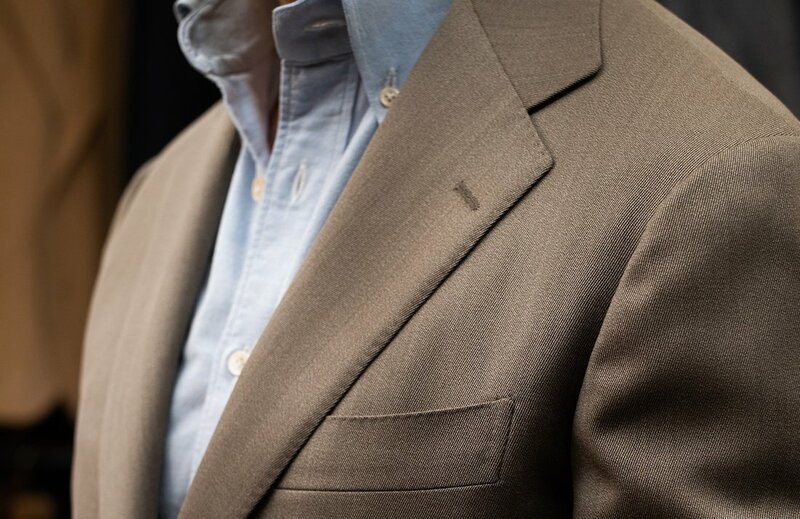 The Ivy influence is clearest in the machined seam around the lapels, where Italian-styled models have that hand stitching (or imitation of hand stitching). 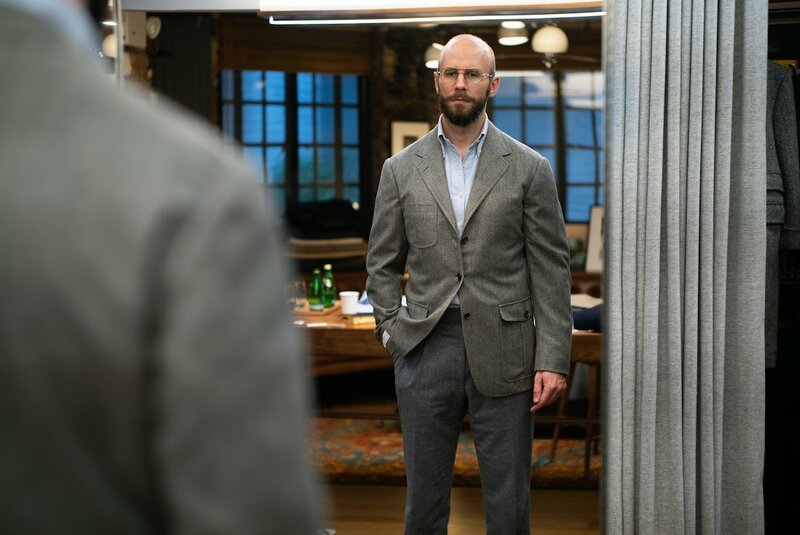 The model 11 is probably least my personal style, but I was interested how much I like it, given it’s the kind of proportions (particularly the lapel) I would never pick for bespoke. The Ring Jacket suits start at $1600 by the way, and the jackets $1200. 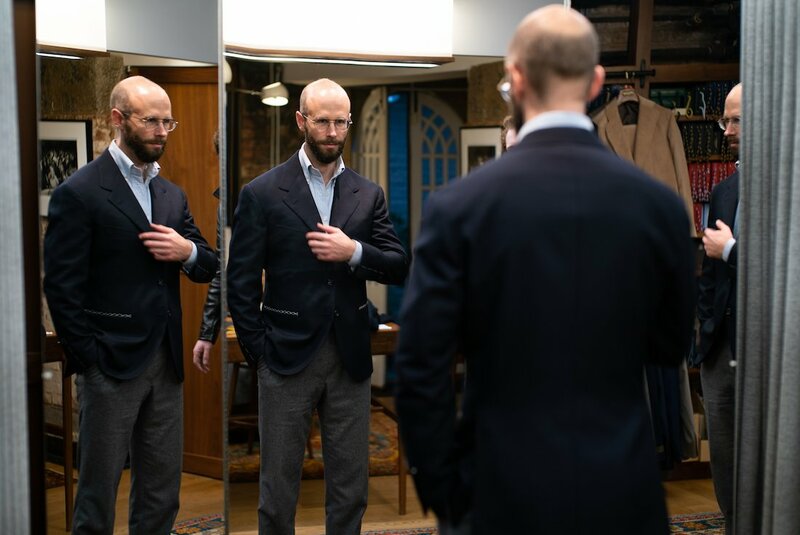 Pretty good value for the quality of the work: all the handwork you’d expect in a high-end ready-made suit, like a hand-attached collar, lining etc. The next level up in terms of handwork and price is Orazio Luciano (above). 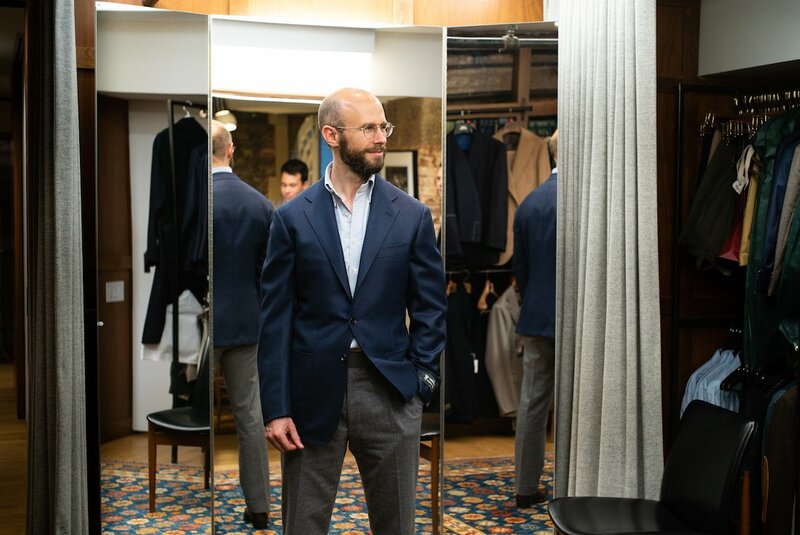 Ready-made there starts at $2800 for a suit, with made-to-measure at $3200. This is a Neapolitan cut and style. 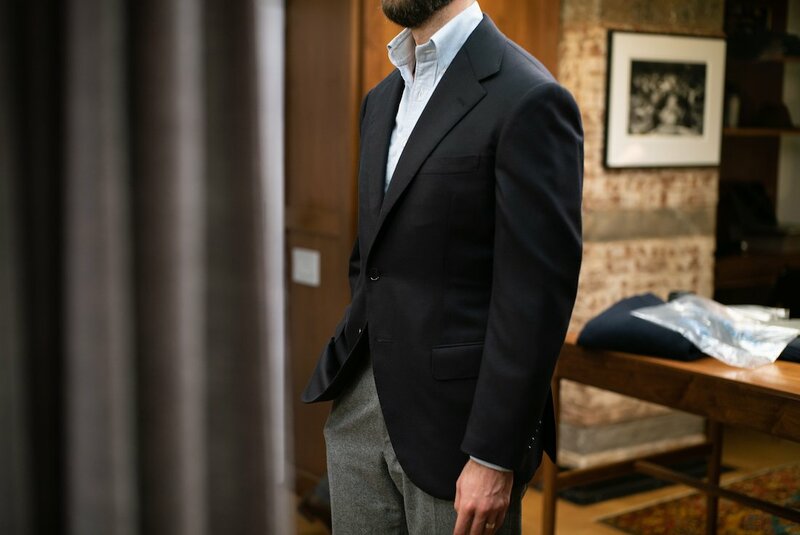 Not too tight or short, but with the curved ‘barchetta’ breast pocket, curved and open fronts, and hand-swelled edges. The extra handwork is largely decorative: hand-sewn buttonholes, hand-attached buttons, hand-attached lining. It is a nice make though - I like the fact the inbreast pocket uses the facing material rather than the lining even if is a separate piece. Liverano is next, which is a style most readers will be familiar with. If anything though, I’d say the style of the RTW (above) is more extreme than the bespoke I’ve had. 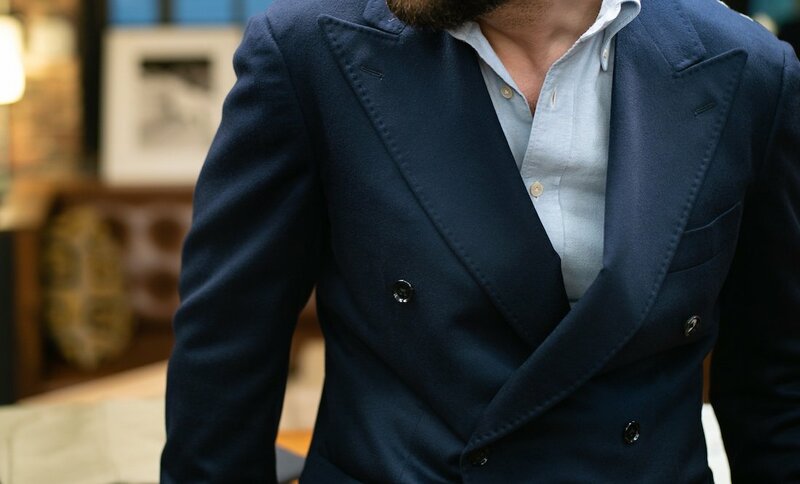 The gorge is lower, the lapel is short and convex, and the buttoning point is low. That effect that a Liverano cut can have, of a strong upper torso without the use of padding, is even more in evidence here. Given the price ($3800 for a suit) I’d be more likely to go for the model 3 if I was picking ready-to-wear. 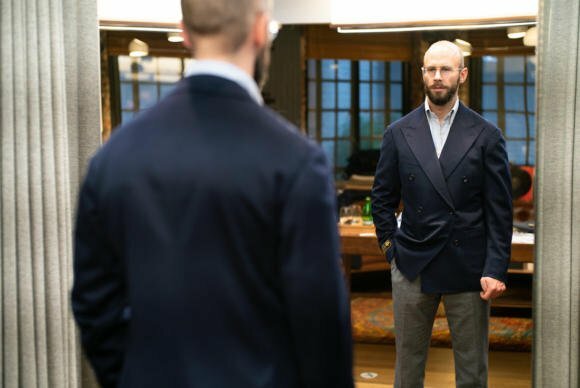 You can see a good range of the current season's Armoury tailoring in their new lookbook, here. You can follow the discussion on The Armoury tailoring: Ring Jacket, Orazio, Liverano by entering your email address in the box below. You will then receive an email every time a new comment is added. These will also contain a link to a page where you can stop the alerts, and remove all of your related data from the site. 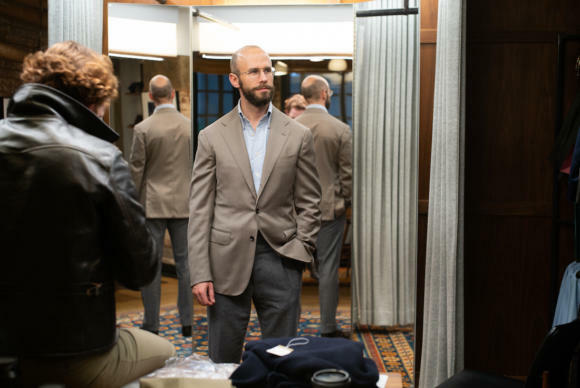 Do you think as a sport coat, does it really need bespoke and prefect/better fit? 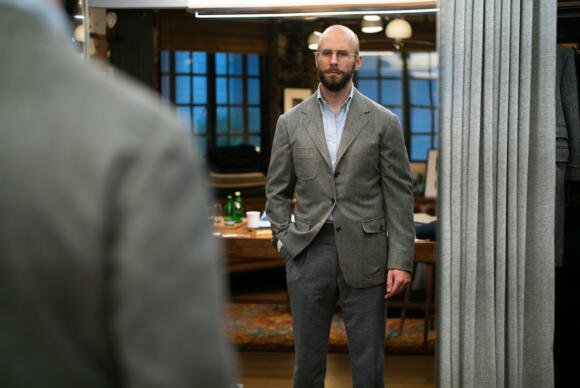 Very nice selection of beautiful products but a bit too dear for my blood ..I mean $1800 for an RTW suit is quite steep, never mind the handwork. But besides the price I love what the guys in the Armoury are doing and wish them any more years of success. I would say the Liverano RTW is quite bulky. Isn’t it? It looks like the jacket doesn’t fit you well. What’s the size of the Liverano jacket you were wearing in the pic ? Do you like the “more extreme” features of the Liverano RTW? My only quibble with your summary is that I have a number of their MTM jackets and wear them with jeans regularly and think they work quite well. Personal taste I suppose. Would you say that, taken purely on style and construction, the Orazio jacket would be the better option if you were primarily planning on wearing it with chinos/jeans? Both jackets look nice. The OL extended shoulders looks good. In your experience, can extended shoulders be achieved without thick padding and not collapse after a while? Hi Simon. What size are you wearing in the OL jacket? 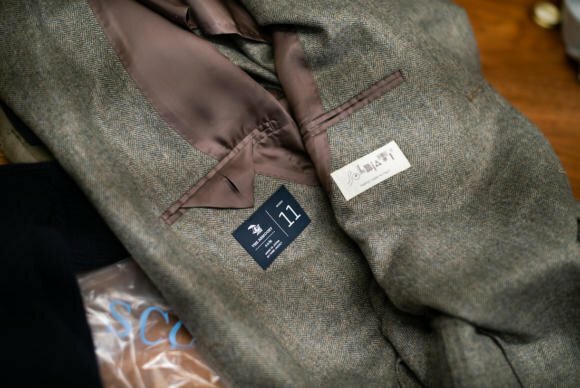 The ‘Ring Jackets’ featured here look great but I suppose that if you live in the U.K. and went to NYC for a trunk show to get an MTM, you’d be subject to a horrendous import tax if you had it delivered to you in the U.K. ? If so, why then don’t they arrange an Armoury/Ring trunk show at Drake’s to circumvent this issue. The tailoring offering at the Armoury is clearly vastly superior to Drake’s own. The Armoury always gets plenty of mention: outside of fashion, are there no other providers of high end RTW (I ask constructively…). I understand your reluctance to wear jacket 3 with jeans as the straight, flapped pockets bring a particular formality. 1 and 6 are similarly formal (though the lapels on 6 are too wide for this particular point in the fashion cycle). The Orazio and Liverano are, perhaps understandably, the most appealing. 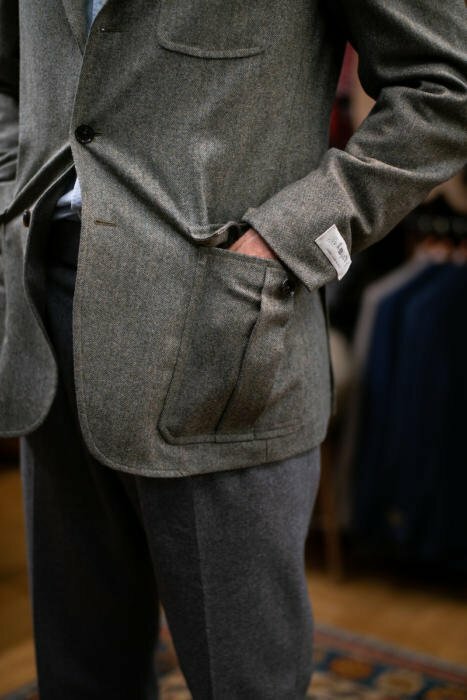 However, not your fault perhaps, there isn’t much of a discussion on value: given the prices I’d rather go bespoke. You discuss quality of finish but it is the quality of construction (and thus fit) that bespoke brings. 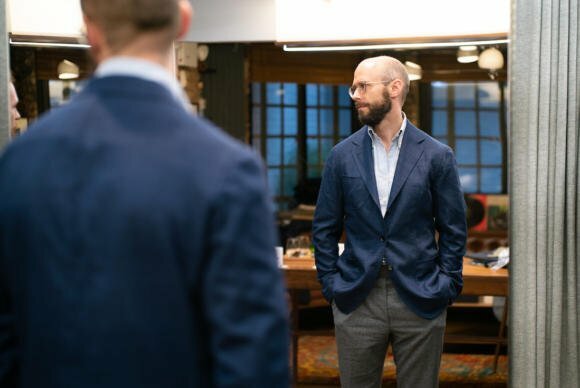 Comparatively, the only benefit, something which you have previously pointed to, is the range and quality of fabric and the ability to try before purchase. 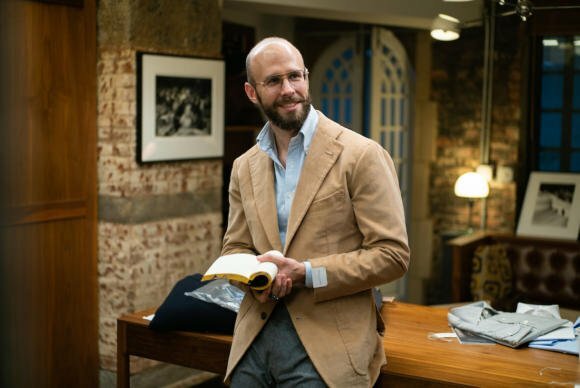 At the head of the article you mention trousers: personally I’d rather see more articles on trousers as they generally don’t get enough coverage within menswear. Jackets (singular or in a suit) seem to get 90% + of coverage. 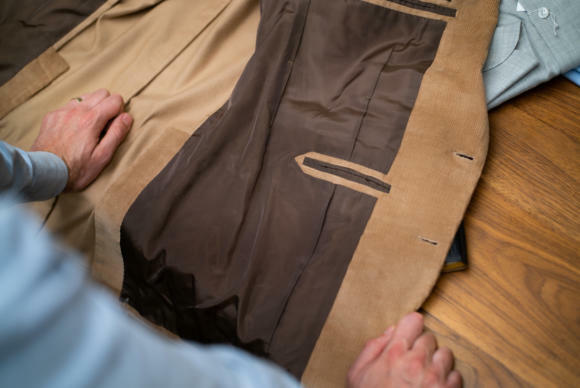 I ask as the issues of what makes a good cut and the associated quality of good fit, outside of length, cuff width and pocket style are always opaque. Architecturally, the shoes are the foundation, the trousers the supporting column of the upper design. As with architecture they look simple however construction is all. From a tailoring perspective front/rear balance, shaping, waist placement and fit, seat and groin fit, front placket design (french etc. ), construction of the fork (and associated rise calculation), zip vs. buttons, adjusters, how differing cloth weights hang and take shape, how synthetics mixes cling, wheather the silhouette compliments or detracts from the jacket (so the merging of styles and lines) are all, I suggest, subjects worthy of analysis and description. Hey simon. Great article. More importantly with pictures of each model. I wished there could have been similar pictures with the armoury trousers article to compare the fit. On a side note is the model 3 padded as what you wrote? It’s featured as unpadded in the shoulder in the website. I personally own a model 3 and I think there is some padding as the shoulders. There is also a touch of rollino which makes it slightly more formal as well. It’s okay on my jacket as it’s a navy sportscoat. Wondering if those features will make most model 3 jackets look more formal, even in more casual clothes/patterns. There is a thin pad in there, yes, but only thin. Nice run-down. Walked past you and Mark on your way into The Armoury’s Pedder shop a week or so ago, talking about plumbing problems, which should have made it easier to say hello, but I was too surprised, and dressed so poorly I didn’t want that to be anyone’s first impression. 🙂 Thank you for this run-down and for all your work. I appreciate both your writing/journalism as well as your work directly with the crafts-people. Simon, do you think the model 7 has a more forgiving fit RTW, given its lack of structure? Hi AJ. What do you mean by a more forgiving fit? Better suited to larger man? good stuff, lovely jackets. But still pretty inaccessible at this price point, which perhaps defeats purpose of RTW coverage! How does the RTW / MTM compare to Drakes? Also – not sure about the glasses… A fashion throwback, a bit hipster and less PS than you are normally! Well, it depends what price points you’re normally looking at. Compared to the best of bespoke, which would normally be £4000+, the best of RTW like this is a lot cheaper. Great article Simon! I’ve been interested in Orazio Luciano for some time now so this information is helpful. I get the sense that the quality of the workmanship is very good, but not up to the bespoke level of Sartoria Formosa? Lovely pieces! Although I’m wondering if it is possible to find RTW suits of a Neapolitan style (high gorge, wide lapels) in the UK without having to spend £1000+? I’m a university student (at the ‘The Other Place’) and cannot bear to wear the thin lapelled blazers from the brands I can afford (TM L & Charles Tyrwhitt etc.) Any help would be greatly appreciated! p.s great blogs keep them up! Cheers. There isn’t much unfortunately. Try Drake’s or Anglo-Italian? How would do you compare the Ring Jacket MTM product vs. Saman Amel’s in terms of internal construction and finishing? On your Saman Amel review you stated that it would even compete with some bespoke Italian tailors, would you say the same of Ring Jacket? Thank you. So with Saman Amel you get a hand padded lapel and all the other functional and decorative hand work you’d expect of bespoke. You also get a careful measurement consultation and, if I understand correctly, at least one fitting. Is the only difference with full bespoke then the number of fittings? The Armoury has a lousy size CHart for an American guy. I have no idea what size to take.Would it kill them to convert to inches? I get your demands for quality. 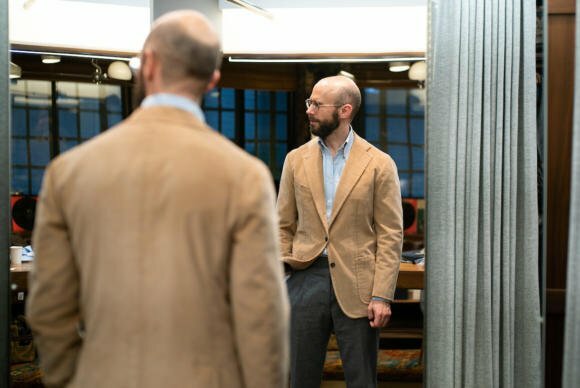 Though not in your sartorial league yet, my wardrobe is evolving to a higher quality, and understand that one cannot return to inferior items once one’s experienced the next level.